When you think of climate change and community resilience, visions of seawalls, renewable energy projects and other physical things may come to mind. But there's another powerful tool that anyone of any age at any time can act upon to help their community weather the harshest impacts of climate change: Kindness. In California's recent wildfires, neighbors knocking on neighbors' doors helped save lives. Checking up on vulnerable neighbors during heat waves, hurricanes, or other extreme weather events can make a big difference for that individual, with global ripple effects. 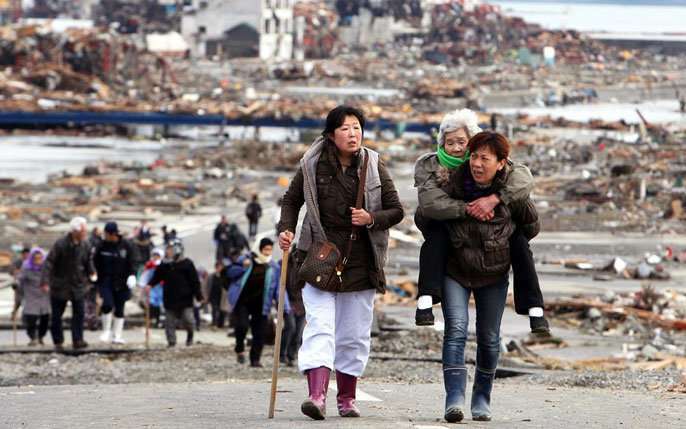 For instance, a study by Daniel Aldrich at Northeastern University looked at community survival rates and reactions to the 2011 Fukushima disaster—a triple whammy of earthquake, tsunami and nuclear meltdown that forced 470,000 people to evacuate. The study found that social networks were the most important defense against disasters. Communities with closer social ties, interactions and shared norms worked more effectively to help their friends, family members and neighbors, in some cases literally carrying them out on their backs. "It's fascinating to think about community and networking as something that keeps us resilient to the impacts of climate change," said Claire Napawan, a UC Davis associate professor of Landscape Architecture and Environmental Design. She began a project called Our Changing Climate that empowers Oakland youth to document and share their experiences of climate change. "There's more funding for top-down solutions and engineered things. But there's enough evidence that shows that's not all that will help. Smaller things that provide quality of life for communities now are investments for the future." There's no need to wait until the winds are at your door. You can start now, simply. A lemonade stand. A community potluck. Helping an elderly neighbor take out her garbage or fix her fence. These are small things many neighbors do with and for each other. Organize or attend a community sporting event, movie in the park, neighborhood block party or parade. If you have the space, garden in your front yard; you'll be amazed how many people you get to know. Not only do these social events and personal actions make people feel good about where they live, they also form the building blocks for when communities are threatened, either by natural events or misguided policies. When neighbors talk with each other, it can embolden community members to make their voices heard to each other, as well as to higher levels of government before and after disasters strike. Strong ties between the community and the government representatives who can advocate on their behalf also make a big difference in how residents recover following a disaster, political scientists have found. Social media can help build grassroots bridging ties, as well. But it begins with building trust and connections neighbor to neighbor. "All of us at some point have been taken care of, and most of us will also care for someone else. But we're meant to pretend that's not true, with more focus on self-sufficiency," said Sheryl-Ann Simpson, an assistant professor of Landscape Architecture and Environmental Design at UC Davis who worked with Napawan on Our Changing Climate. "But what would it look like if our public policies focused on care? I think a lot of magical things can happen then."